According to sources, the first foundation of a chapel dates back to the 7th century. The original complex, whose first patrons were the Ubaldini family, was independent until was it donated in 1212 to the Franciscans on the occasion of the saint’s passage throughj Borgo San Lorenzo. It was included in the parish of San Michele al Bosco and was later named San Francesco al Lago or al Bosco. 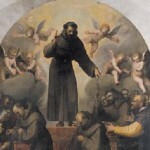 Saint Bonaventure of Bagnoregio, general of the Franciscan Order, was there some years later and received in 1273 the cardinal investiture by Pope Gregory X there. His exemplum virtutis is famous: the friar, who was caught washing the dishes by the papal legates sent to deliver his cardinal’s insignias, did not stop working and asked them to leave the paraments on a small cornel tree nearby. The 1349 plague led the Franciscans to abandon the convent in a period when the Ubaldini’s power was slowly dying while that of the Medici family, originally from the Mugello, was increasingly asserting itself. In fact, they had extensive properties in the area, including the large fortress-villas of Trebbio and Cafaggiolo. Around the 1420s, Cosimo the Elder purchased the land where the religious complex still stands today with the surrounding woods. Having obtained its patronage, he began modernization works. The project was entrusted to Michelozzo, together with works for Trebbio and Cafaggiolo, as attested by Vasari’s biography dedicated to the famous architect. In this simple and essential architectural complex, with a penchant for the classical canon that confirms the choices of the Medici patrons, there was a decorative device that visitors today must recreate using their imagination as it was altered by the later renovations. 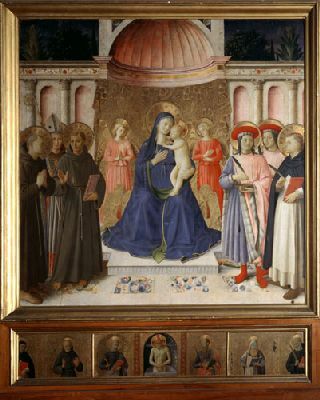 The main altar was decorated with the wonderful altarpiece by Fra Angelico, known exactly as “the Bosco ai Frati altarpiece”, depicting the Madonna and Child among saints, that was first transferred to the Uffizi Gallery by Pietro Leopoldo and is now found in the San Marco Museum in Florence. 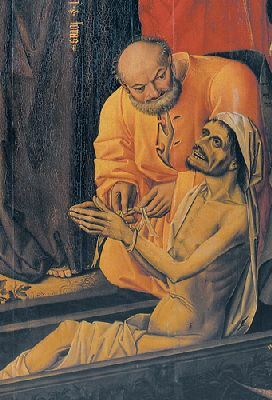 On one of the altars was also found the famous triptych with the Resurrection of Lazarus by Nicolas Froment, dated 1461 and housed today in the Uffizi Gallery. 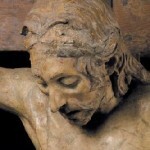 Also the Donatellian-school Crucifix dates back to the same years. 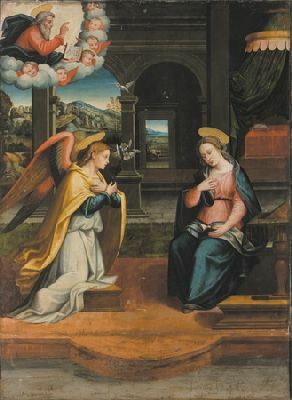 It is the only surviving work from the subsequent expropriations and was rediscovered by Alessandro Parronchi in the church’s crypt. The Crucifix is found in the hall which was the former chapterhouse and now houses the collection of sacred art that includes some 16th-and 17th-century paintings as well as sacred furnishings and vestments. The loggia overlooking the garden, where the tiny chapel of Saint Bonaventure opens, closes the splendid and striking tour. The panel painting is found on the left wall of the nave. 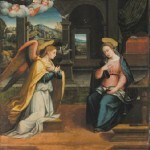 Against a background with an arcade opening on a distant landscape, the angel and the Virgin are in affectionate conversation while, above to the left, the benedictory Father appears. The devout charm of the poses and a luminosity of color are to appreciated. 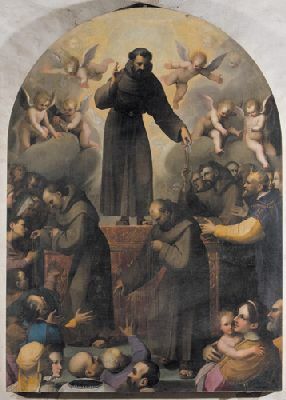 This painting follows an iconography that was very dear to the Franciscans who wanted to disseminate images of the saint’s life for didactic and moralizing purposes. 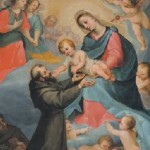 Francis appears in the act of handing the cord of his robe to the Church, which is personified by the female figure on the throne. There is a crowd of figures at her feet, among whom is the pope, awaiting the holy cord. Found on the left wall of the nave, the strongly devotional painting is characterized by a simple and clear subject. The rich and bright chromatic range and the delicate brush strokes in the painting of the clothes and faces place it near the style of those artists moving between Tuscany and Rome towards the end of the century, like Ciampelli, Commodi or Giovanni de’ Vecchi. Size: 174 cm. x 173 cm. 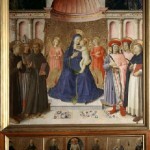 The painting, housed in the San Marco Museum, was commissioned by Cosimo the Elder for the Church of Bosco ai Frati. 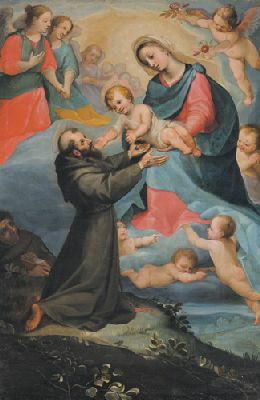 The Madonna with Child sits on a bench, a reference to Franciscan simplicity and Mary’s humilitas, among the saints Francis, Louis of Toulouse, and Anthony as well as Peter, Cosmas and Damian, the Medici family protectors. 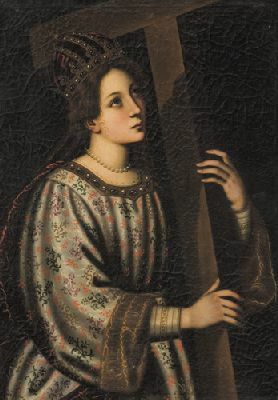 The Child clutches a pomegranate, symbol of the Church. the seeds are the fruits as all the faithful are tied to the brothers in a single family. 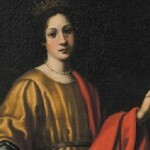 The artist Pietro Confortini, the brother of the more famous Jacopo, left many of his works in the Mugello where he was active in the 1620s. This painting, found in the room of the Crucifix, depicts the saint with the usual wheel of her martyrdom. On the left wall, as you enter the church, this curved painting centers on the figure of Christ in the foreground, supported by Saint John and the Virgin. 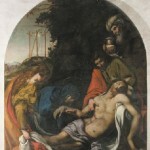 Behind them, Joseph of Arimathea holds the oils for the burial rite while the Magdalene is seen from behind at Jesus’s feet. Size: 168 cm. x 160 cm. It is a work of great fascination because of the quality of the intaglio and above all the profound expressivity of the face, captured at the tragic moment of death. Its naturalism almost seems highlighted by the damage of time that has partly altered the features. 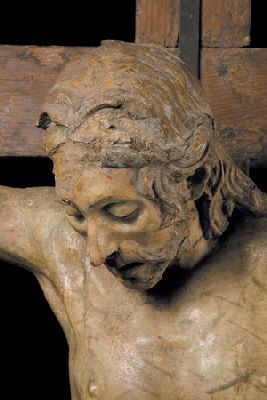 Some scholars have suggested that this crucifix ( and not the one in Santa Croce) is the one mentioned by Vasari in a famous anecdote recorded in his Lives where Donatello and Brunelleschi challenged each other around the theme of Man. 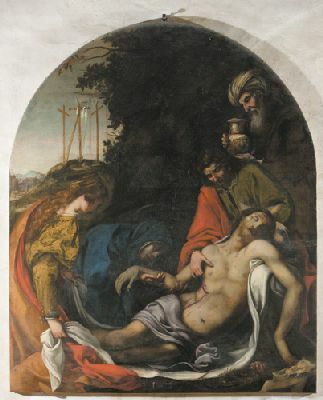 The painting’s typology follows a northern painting tradition: a larger-sized central panel, depicting the Resurrection of Lazarus is flanked by two painted doors. On the left is Jesus in the house of Martha and on the right is the Washing of Feet. The triptych is currently found in the Uffizi Gallery. The painting in the room of the Crucifix, depicts the saint in half-figure. 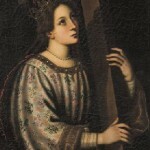 Sumptuously clothed, she holds the cross. 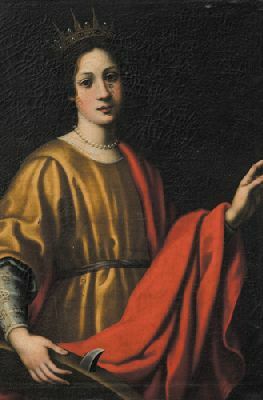 The artist Pietro Confortini, the brother of the more famous Jacopo, left many of his works in the Mugello where he was active in the 1620s. The complex and the collection of sacred art can be visited upon appointment with one of the friars.